To read individual sections of the Reg Map, click on the headings shown below, or click on the individual sections of the Reg Map. To view an enlargement of the entire Map, click on a blank portion of the image. The Reg Map was created by ICF Consulting with the cooperation of the U.S. General Services Administration's Regulatory Information Service Center. The Reg Map is provided on the Reginfo.gov website as a service to users of this site. 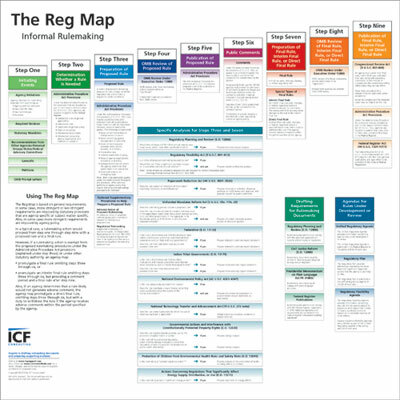 A link to ICF Consulting's website is provided for the convenience of users who may wish to obtain a free printed copy of the Reg Map. The General Services Administration does not endorse either the products or services of ICF Consulting. GSA takes no responsibility for, and exercises no control over, the organizations represented, or the views, accuracy, copyright, or trademark compliance or legality of the material contained on the ICF website. View a PDF version of the Reg Map.